During the two hours I spent talking with Brit Marling and Zal Batmanglij in February, the conversation eddied its way around the following topics. The movies of Krzysztof Kieślowski. The neuroscience of trauma. The painter and novelist Leonora Carrington. Noise shows in San Francisco. Hilma af Klint and the origins of abstract expressionism. Hannah Gadsby’s Nanette. Malcolm Gladwell’s podcast. Cassandra and the gift of second sight. Adam Curtis’s HyperNormalisation. The scourge of irony. Yuval Noah Harari’s Sapiens. The serenity of Le Pain Quotidien. We were sitting at the dining table of what seemed to be an Airbnb apartment in L.A.’s Los Feliz, but it felt at times as if we’d been accidentally transposed into an upcoming novel by Don DeLillo. Marling and Batmanglij, if you haven’t encountered their work or deduced from the above, are probably the two most erudite people in Hollywood. Within the larger, seamier confines of the entertainment industry, they stand out like a pair of unicorns on the Las Vegas strip. Their partnership works so well, you sense, because they’re like two halves of the same brain. Marling, who’s 36, is the gentler of the two, soft-spoken and intentional, while Batmanglij, who’s a year or so older, is fierier and more passionate. She’s blond, and wearing a rainbow-colored sweater over houndstooth pants; he’s dark-haired, and dressed in black. The musician Sharon Van Etten, who stars in their Netflix series The OA, told me over email that Marling is “very sensitive. Intuitive. A caretaker. Collaborative. Zal is intense. Thoughtful. Driven.” The two complement each other, Van Etten said, but they also push each other, and each other’s work, to the limits. It’s easy to imagine a world in which they never met, never found their niche in filmmaking, never made it to the position they occupy now as creators of one of the strangest and most original shows of the Peak TV era. Marling sometimes imagines a timeline wherein their movie Sound of My Voice never made it to Sundance in 2011 and she became an environmental lawyer instead. Somehow, though, everything fell into place. They found success on the indie-film circuit, and then they made a studio movie, The East, and then Netflix happened. Silicon Valley’s incursion into the entertainment world meant that suddenly a major corporation with colossal spending power was willing to green-light a series about an interdimensional traveler who goes by the name OA: Original Angel. 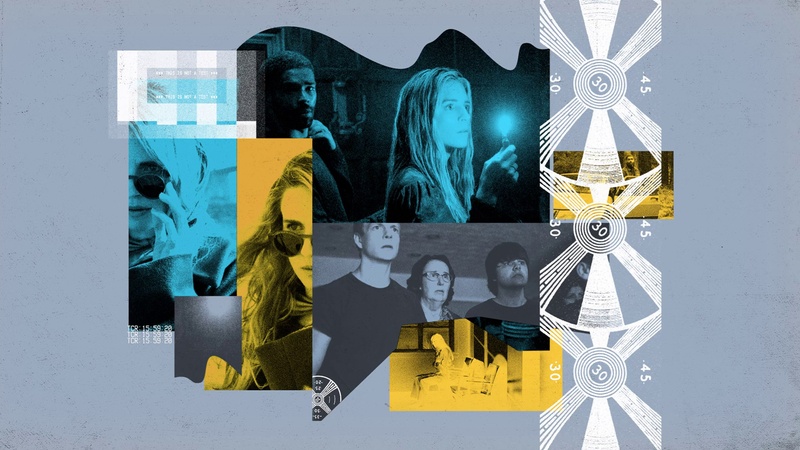 When The OA debuted in a surprise drop at the end of 2016, it quickly became one of Netflix’s coveted word-of-mouth hits, as viewers furiously debated its meaning, its mythology, its magniloquence. In the series, Marling plays a woman named Prairie, who wakes up in a hospital bed and is reunited with her adoptive parents after having been missing for seven years. There are two immediate surprises: Though Prairie used to be blind, she can now see. And she insists that her name isn’t Prairie anymore, but “the OA.” The mystery of Prairie/OA only deepens as the show continues. She gathers a group of disaffected high schoolers and tells them stories about her life—how she was kept in captivity by a scientist named Hap (Jason Isaacs) and forced to undergo near-death experiences. The series urges you to wonder: Is the OA a survivor? A nascent cult leader? A miracle? A fraud? The OA’s metaphysical elements, its ideas about parallel universes and supernatural dreams, cast the show into a new wave of speculative storytelling on television. It followed Netflix’s Stranger Things, an ’80s-steeped sci-fi series about psychokinesis and monsters from other dimensions, and NBC’s The Good Place, an office comedy of sorts about life after death and the meaning of morality. More recently, Russian Doll on Netflix presented a scenario in which a woman dies over and over again, using it to explore the question of what people can mean to one another in this complicated, heartbreaking plane of existence. As Marling and Batmanglij prepare to roll out the second season of The OA on March 22, these are the kinds of things they’re thinking about. They’re exhausted, mostly, in that bone-deep, anxiety-saturated, slightly surreal way when you’ve been working 14-hour days for as long as you can remember. They’re worn out from envisioning, writing, directing (in Batmanglij’s case), and acting (in Marling’s) in an eight-hour story that’s taken more than two years to finish, and that doesn’t even begin to conclude the original plan they had for The OA. But they’re also wondering what it means to try to tell empathic, sincere stories to audiences much more accustomed to cynicism and irony. Because, when it comes down to it, which side is more likely to give first? It feels important to note at this point that if the darkness of the universe is going to eventually wear down Marling and Batmanglij’s ambition, or their spirit, it hasn’t happened yet. Season 2 of The OA, in some ways, is even odder and more ambitious than the first. For one thing, there’s its tone, a film noir set in modern-day San Francisco. After finishing Season 1, Marling and Batmanglij left Los Angeles and went north. They spent time with environmental activists, with people running homeless shelters, at tech companies developing augmented-reality software. They hung out with friends who run, in Marling’s words, “a kind of anarchist mixed-purpose lab space.” They never really knew what any of these experiences would come to mean, but almost all of them ended up in the final story. Around 2009, Cahill and Marling had spontaneously begun making Another Earth, a speculative drama about the discovery of a mirror planet just like this one and a 17-year-old girl (Marling) who begins to consider its possibilities following a tragic accident. After seeing how well this gonzo, just-do-it approach to filmmaking had worked out, Batmanglij and Marling tried the same thing with Sound of My Voice, a script they’d written about an enigmatic spiritual leader who claims to be a time traveler from the year 2054. The movie cost $130,000 to make, and took three months to film. Last minute, they submitted it to the Sundance Film Festival, and it happened to be accepted, as was Another Earth. Almost instantly, Marling went from being a total unknown to someone who had two films debuting at arguably the most prestigious film festival in the world at the same time. “It’s a culture of power and abuse,” Marling said. “It’s very specific individuals who set the tone of a space.” (In 2017, Marling wrote an essay for The Atlantic about her experiences being propositioned by Harvey Weinstein and the ways in which economic gatekeeping makes sexual abuse and harassment even more endemic within Hollywood.) In 2012, the pair began a three-year process of figuring out a much bigger project, a long-form story that charted multiple seasons and took a novelistic approach to television. During this time, Marling acted in a handful of side projects, appearing in The Keeping Room, an action thriller set during the final days of the Civil War, and in Babylon, an offbeat TV comedy about London’s Metropolitan Police. Batmanglij worked as a director on the Fox sci-fi mystery Wayward Pines, where he met Matt and Ross Duffer, two brothers who were then writers for the M. Night Shyamalan–produced series. But Netflix wasn’t only changing the way television was commissioned and produced. It was also upending the whole system for how shows were consumed. Previously, when debuting their work, Batmanglij and Marling had been at film festivals, buffeted by small audiences of professional critics and cinephiles. The OA was different. Overnight, it landed on a platform where it was accessible to hundreds of millions of people. There was no soft opening, no way to ease their series into the world. The OA dropped, and people began to watch it, and to respond to watching it in real time, broadcasting their thoughts to their social-media feeds, and there was no way back. Batmanglij and Marling have a bond that is hard to describe but fascinating to observe. They finish each other’s sentences and jump in with observations that embellish the point the other is making. They’re enormously solicitous of each other, throwing out compliments randomly, and apologizing, always, when they interrupt each other. When I asked how they balance processing criticism with sticking to their ultimate intentions for the show, Batmanglij immediately jumped in, in an instinctively protective way. Marling doesn’t engage with the world online, he said. He has to pressure her into occasionally posting to social media, like, “Let’s Instagram, Brit, because it’s fun!” But it’s not an environment that feels natural for her, at all. What Is The OA Actually About? When the first season of The OA was released, Marling stayed away from the internet. Batmanglij, by contrast, read everything. “I couldn’t get out of bed,” he said. “It wasn’t a bad feeling. On that Friday when the show dropped, I’d never experienced anything like it in my life. Every single second there was a tweet about this story.” The first wave of reviews was also going live, followed by the more intensive responses to the show—the Reddit threads unpacking the clues and mysteries buried within it. Some critics described The OA as transcendent, blurring the boundaries between genres and mediums and redefining what television could be. The TV critic for Variety lambasted the show. The film critic for Variety countered, calling it one of the most significant works of 2016. The OA, as a television show, is radiantly, transparently earnest. In the final episode of Season 1, a group of teenage boys—teenage boys!—and a middle-aged woman respond to the palpable horror of another armed teenager in a school cafeteria by launching into the movements that the OA has taught them, the movements she promises can open a portal to another dimension. In the crisis of that moment, the OA’s followers are unafraid of what their peers might think or how people will respond. The only thing that matters is trying to avert a tragedy. They did, however, allow a little more cynicism to enter the world of Season 2, via a new character, an investigator called Karim (played by the British actor Kingsley Ben-Adir) who teams up with OA/Prairie to search for a missing child. Ben-Adir read for the part without having watched the first season, but when he caught up with it afterward, he found the cafeteria scene intensely moving. So much of the show, he told me, “is up for interpretation. I don’t think we’re used to seeing that.” Karim, in Season 2, often functions as an avatar for more skeptical viewers, responding to the events unfolding around him with the arched eyebrow of the hard-boiled detective. You do it, maybe, by being sincere, by keeping the hope, always, that the work you make might not be able to change the whole world, but it might reach a tiny part of it. Or, on Netflix, it might also reach people you’ve never dreamed of.